There are a couple of primary themes in “Big Hero 6,” Disney’s latest CGI kids’ adventure movie, but it has a lot going on besides that. There’s action, adventure, a wonderfully diverse set of characters, and a handful of lessons kids and parents can take away with them to talk about later. Saying that a movie is for all ages is a little trite, but this one really is. Kids too young to deal with some cartoonish action and the idea of people dying are about the only ones who should sit this out. “Big Hero 6” focuses on young Hiro (Ryan Potter), a child prodigy with robotics who is failing to follow in his older brother Tadashi’s (Daniel Henney) footsteps. He’s unmotivated, disinterested in going to college, and so on – until Tadashi brings him along on an errand to the lab he shares with a group of fellow science students (plus the group’s equivalent of Shaggy – Fred, voiced by T.J. Miller) at the nearby university. They all work on wildly different projects, and before long Hiro has been convinced to take a shot at getting into the school. Things don’t go as well as Hiro and the audience hope, of course, and soon Hiro is recruiting his brother’s medi-bot to help him investigate a crime. Eventually everyone in Tadashi’s lab gets recruited, each with their own snazzy outfits and cool tools. It’s exciting to see a crew of robotics geeks on the screen who are not only unabashedly excited about their work but completely oblivious to the gender and race differences among them. Two of the six members are women, one’s a robot, and more than half the humans are people of color – and it’s just not mentioned. One of the women is stereotypically femme, with long blonde hair and lots of pink, but her inventions are just as useful and cool as those of the other gal, who’s short and pretty butch. It’s a wonderful change from the CGI films of recent years where all the women look like the same model with a few tweaks while the men come in all sizes and shapes. 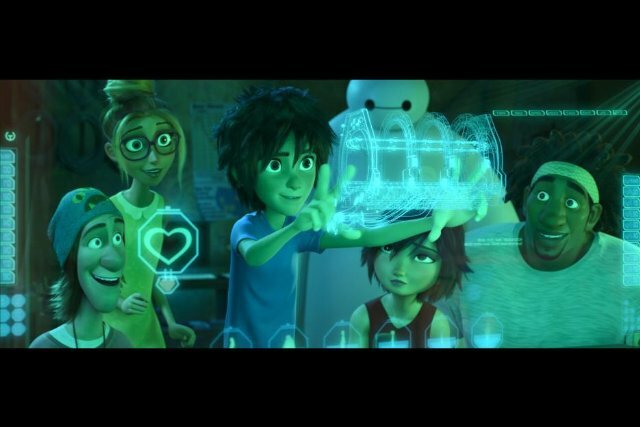 “Big Hero 6” is teeming with people, and they all look different.